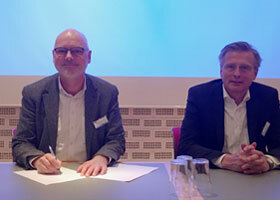 Prorector for research and innovation, Thomas Bjørnholm (left), signing the new partnership agreement together with GTS chairman Søren Stjernqvist (right). Danish businesses should have better access to the specialised knowledge and technology that are available at the University of Copenhagen and at the GTS institutes (Advanced Technology Group). This is the ambition behind a new partnership agreement which was signed at the Danish Technological Institute on 20 December 2017. One of the main purposes of the new partnership is that the GTS institutes’ closer contact to Danish businesses will help build bridges to the specialised knowledge in the University's research environments. "We’re very keen to ensure that the research conducted at the University of Copenhagen is brought into play in Danish society. With this partnership, we have a better platform for reaching Danish businesses that are working to develop the technology of tomorrow," says Thomas Bjørnholm, Prorector for Research and Innovation. The contact with businesses will primarily be in the form of tripartite partnerships with the participation of the University of Copenhagen, a GTS institute and a given business. The partnership will also create new opportunities for students at UCPH. As part of the partnership, the GTS institutes will establish internships for students, just as there will be greater awareness of the option to write their thesis in collaboration with small and medium-sized businesses. For PhD students, collaboration opportunities will be increased through more co-funded PhD programmes and better joint use of the options in Innovation Fund Denmark's Industrial PhD scheme. "It may be of great value for students and PhD students who are specialising within a specific technological subject area to engage with a relevant GTS institute, where the use of the technology in question is central. It can provide a different perspective on the subject area, which may be of great value for students in their transition to the job market. This prepares our graduates for their future jobs and gives businesses access to the latest knowledge," Thomas Bjørnholm says. The new partnership runs for five years and also covers collaboration about research facilities and infrastructure. See list of GTS institutes in Denmark.